The graph below is an illustration of a participant’s Culture in the Workplace Questionnaire™ results for one of the dimensions, Certainty. In these scores, we are comparing the participant’s individual scores to country averages. As such, there are many individuals in these countries with scores that differ from their own country averages (and that may be closer or further from the participant’s scores). National tendencies are indicated clearly through the country scores. The participant (an American) in this case is very similar to the larger U.S. sample. American participants often, but not always, score quite “low” on the Certainty dimension, meaning that they prefer an environment which is less bound by rules and regulations more than many of their counterparts in other countries. 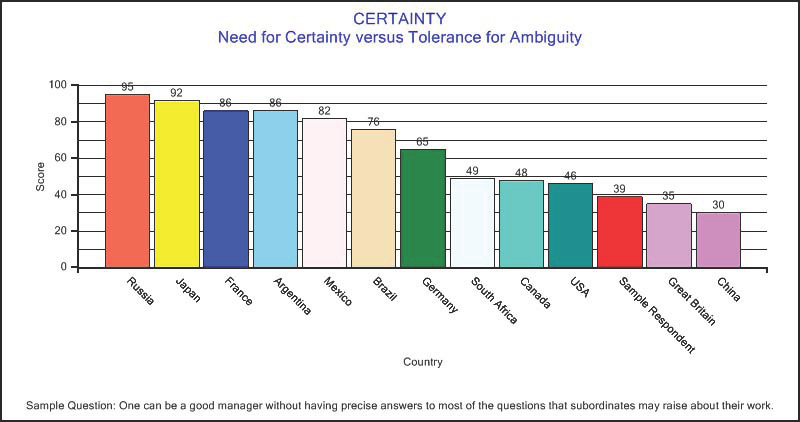 In the Certainty area, the participant’s score is at the low end of the Certainty dimension and indicates a preference for Tolerance for Ambiguity. People with a Tolerance for Ambiguity appreciate organizations that encourage individuals to use creative approaches. They believe that there should be no more rules than is strictly necessary, and that rules may be broken for pragmatic purposes. It is acceptable to challenge and question “the way things are done.” There is a tolerance of differences, innovative ideas and a wide range of behaviors. Managers are mainly concerned with strategic issues and it is accepted that they may not have all the solutions at any given time..
For more information about the full six dimension Culture in the Workplace Questionnaire™ and its cost, please contact Culture in Workplace.